Frensham Ponds were originally created in the 13th century to supply fish to the Bishop of Winchester whilst visiting Farnham Castle. Today the ponds (great and little) and the surrounding area is a sanctuary for wildlife and is a Site of Special Scientific Interest. Look out for reed bunting, sedge warbler and great crested grebe, as well as nightjars and woodlarks. The great pond is also the backdrop for an hotel and used for sailing and fishing. Part of the Greensand Way that crosses Surrey, and once drained during WWII as they were visible landmarks for the enemy, Frensham Little and Great ponds provide a wonderful local location to discover. A perfect place to run, walk dogs, build sandcastles, sail and even paddle in the summer months. Both have cafe facilities. 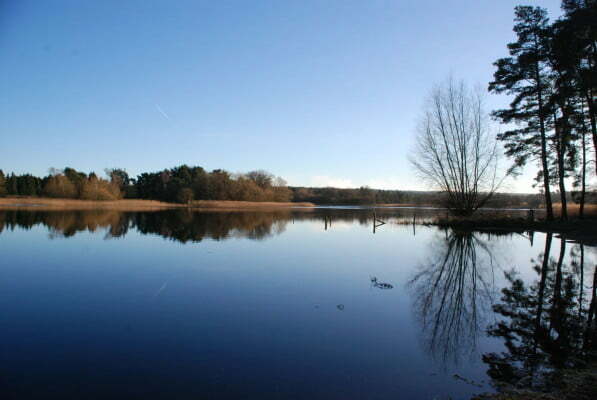 Frensham Ponds are part of the National Trust network and managed by Waverley Borough Council. For a relaxing day whatever time of the year, Frensham Ponds are a great escape from the hustle and bustle. Follow a beautiful walk with a cream tea at Frensham Pond Hotel, Frensham Garden Centre or the Rural Life Centre.